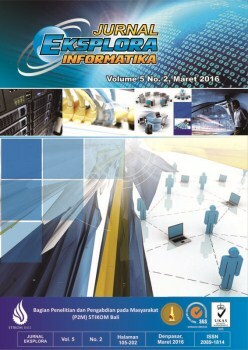 Ariesta Kartika Sari, Analisis Karakteristik Gaya Belajar VAK (Visual, Auditorial, Kinestetik) Mahasiswa Pendidikan Informatika Angkatan 2014, Universitas Trunojoyo Madura, Bangkalan, Indonesia. R. Dunn, A. Honigsfeld, L. S. Doolan, L.Bostrom, K.Russo, M. S. Schiering, B. Suh, H. Tenedero., Impact of Learning-Styles Instructional Strategies on Students’ Achievement and Attitudes: Perceptions of Educators in Diverse Institution., Clearing House. R. L. Goldstone, Perceptual Learning, Annu. Rev. Psychol. 1998, 49:585-612, Pyshology Building, Indiana University, Bloomington, Indiana, 47405, 1998. McCracken, M., Almstrum, V., Diaz, D., Guzdial, M. Hagan., D., Kolikant, Y.B., Laxer, C., Thomas, L,. Utting, I. & Wilusz, T., A multi-national, multi-institutional study of assessment of programming skills of first-year CS students, SIGCSE Bulletin, 33(4), pp.125-180, 2001. Yadin, A., Reducing the dropout rate in an introductory programming course., ACM Inroads, 2(4), 71-76, 2011. Hartree, D.R., Calculating instruments and machines, Cambridge University Press. SitiRosminah MD Derus, Ahmad ZamzuriMohamad Ali., DIFFICULTIES IN LEARNING PROGRAMMING: VIEWS OF STUDENTS, Faculty of Art, Computing and Creative Industry, Malaysia. Wrubel, M.H., A primer of programming for digital computers., McGRaw Hill. Wilkes, M. V., Automatic digital computers, Cambridge University Press. A. F. Blackwell., What is Programming?, University of Cambridge Computer Laboratory, pages 204-218. E. Lahtinen, K. Ala-Mutka, and H.-M. Järvinen, A study of the difficulties of novice programmers, ACM SIGCSE Bulletin, vol. 37, no. 3, p. 14, Sep. 2005. T. Jenkins, On the difficulty of learning to program, in Proceedings of the 3rd Annual Conference of the LTSN Centre for Information and Computer Sciences, 2002, vol. 4, pp. 53–58. A.Gomes dan A.J. Mendes, Learning to program diffuculites and solutions, International Conference on Engineering, 2007. C. Rinderknecht., A Survey on Teaching and Learning Recursive Programming., Department of Programming Languages and Compilers, Budapest, Hungary., Juli 2013. A. Pears, Stephen Seidman, Linda Mannila, Maria Devlin, Lauri Malmi, Jens Bennedsen, Elizabeth Adams, James Paterson., A Survey of Literature on the Teaching of Introductory Programming. Anthony Robins, Janet Rountree, Nathan Rountree., Learning and Teaching Programming: A Review and Discussion., Computer Science, University of Otago, Dunedin, New Zealand. Lynda T., Mark R., John W., and Emma J., Learning Styles and Performance in the introductory Programming Sequence, Department of Computer Science, University of Wales, Aberystwyth, UK. Vivian C., Michael J., The significance of learning sytle with respect to achievement in first year programming students, ECU Publications Pre.2011, Edith Cowan University Research Online. L. Fowler, V. Campbell, D. McGill, and G.G. Roy, An Innovative Approach to teaching First Year Programming Supported by Learning Style Investigation, 14 th Annual Conference for Australasian Assocication for Engineering Education, Melbourne, Australia, 2003.